Considering that on the 1st December 2013 I had only 1 single Tactical Squad completed, I am very happy with the number of units I can now present which are fully painted. Next up is my 2nd Dreadnought, Assault Marines, Drop Pod and then on to Centurions, Sternguard, 3rd Tactical Squad... and the list goes on! If I can continue at this rate I could be looking at having my entire army fully painted by March/April time! Just in time for moving on to something different. Orks maybe? I absolutely love the Venerable Dreadnought model. I picked this unit up in May last year but only managed to get around to painting it over the last couple of weeks. Thanks to the advice of Jai, from Games Workshop Bath, I picked this model up instead of the traditional variant. I have used it as both a standard and also a Venerable Dreadnought but this model is far superior [to the bog standard model] in my opinions and so when I realised that there was nothing stopping me from picking up the Venerable model it was a done deal! After reading some forums for effective layouts for Dreadnoughts I picked up a couple of the Forgeworld Autocannon weapons and these are the weapons which can be seen on the photo above. I have to admit that I wasn't very impressed with the quality of the weapons- the barrels were warped and the level of detail was very quickly lost under the payers of paint... however for £8 per weapon they werent particularly expensive so its not the end of the world. I'm yet to be convinced that the 'rifleman' load out (2 x twin linked Auto-cannons) is viable in 6th... and especially against Chaos (who I battle most regularly) however for fluff centred lists which I tend to go for, it certainly has a place so I will continue to experiment while I paint up the further weapon options. My first purchase when I returned to the hobby was the Dark Vengeance boxed set. For £60 it is (for GW standards) a bargain and a great way to get you started in the hobby- although I guess that is the point of it! 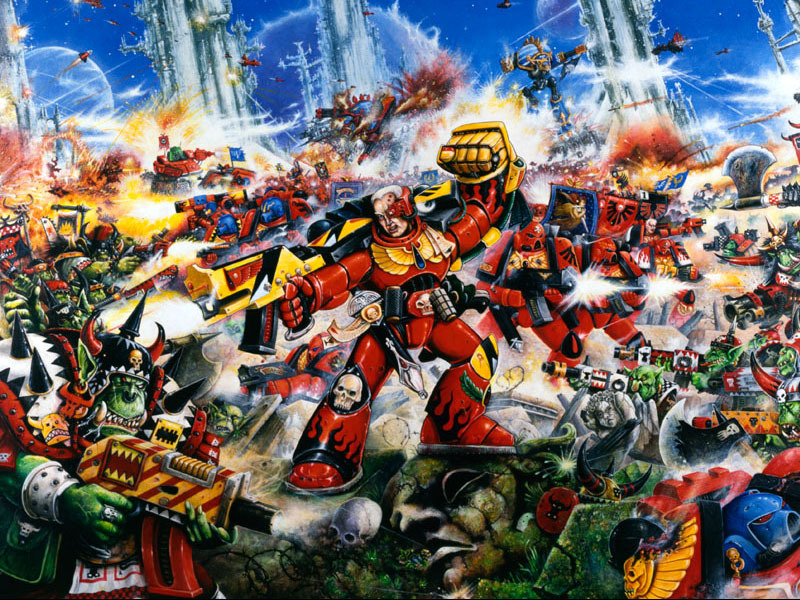 Anyway, once I had DV I had to decide which chapter colour scheme I was going to paint my marines. During this time I was still the Community Manager of the Light Knights and so I decided to try and bring these two elements of my life together. Whilst the LK were playing a superhero MMO called Champions Online we settled on a 'guild' outfit which was based around a light blue primary and dark blue secondary colour scheme. The initial colour scheme which I settled on is represented here on the left, and my firs 'test' model is on the right. 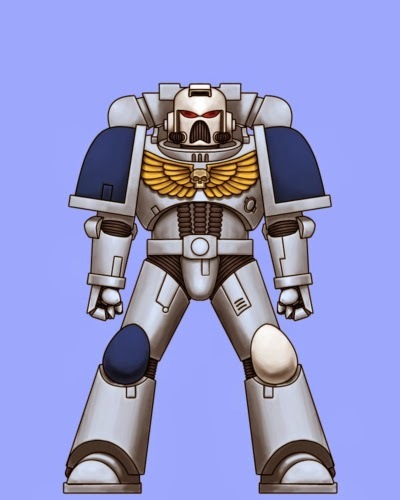 This colour scheme has developed since these early days and has now been slightly simplified - as well as altering the helmet colour to be more inline with the codex astartes (i.e. Veterans have white helmets, not normal marines). 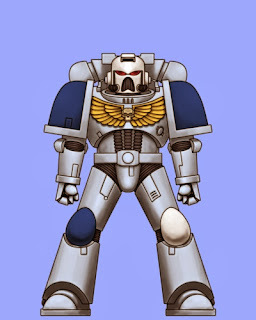 The light blue sections of the armour are painted in the Space Wolf colour scheme and dark Blue follows the Ultramarine scheme. In my next post I will begin to cover the units which i have currently painted- my Lysander conversion, scout squad and tactical squads. I will also mix these up a little with some more LK chapter fluff.